If you live in the Northern hemisphere, you may consider Cobaea scandens, otherwise known as cup and saucer vine, an odd choice of Christmas Flower Candy. But in our coastal garden, high up in the canopy of the bay tree, this rampant climber is still flowering for all its life is worth. Our cup and saucer vine has weathered gales and several chilly nights during December. We’ve been rewarded with hundreds of greenish-white, bell-shaped flowers which quickly flushed light purple. The fragrant flowers are carried proud of glossy foliage on long stems, perfect for flower arranging. Cobaea scandens is easily grown from seed. A single plant is sufficient to cover a large wall or pergola, coming into its own from late summer when other climbers are starting to fade. The unadulterated species has purple flowers; a white variation, Cobaea scandens f. alba has sophisticated creamy-white blooms. 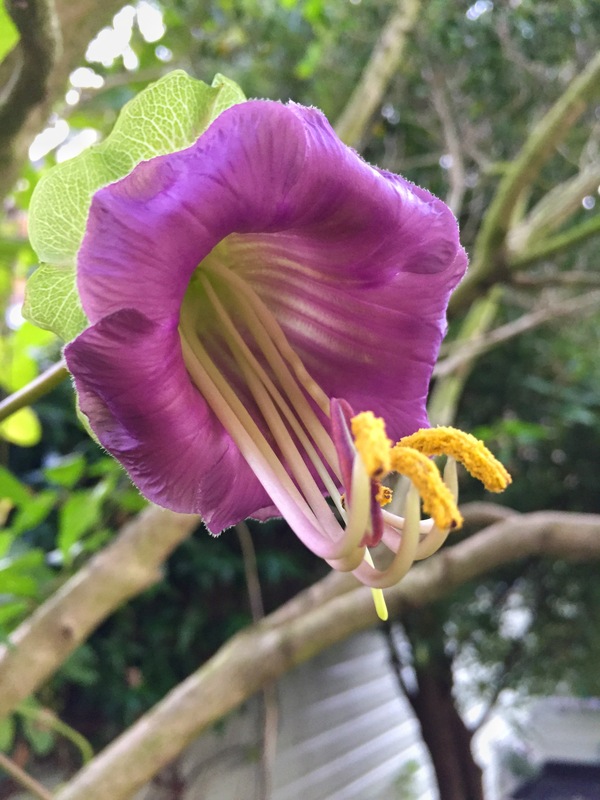 Cobaea flowers have a fascinating strategy for attracting pollinators. They exude a unpleasant smell when they first open: in their natural habitat this attracts pollinating bats, but in Europe these are supplanted by flies. Later the perfume evolves to become an attractive honey scent, drawing bees towards ample pollen. An even finer flower, although harder to track down, is Cobaea pringlei a climber which produces large, white, funnel-shaped flowers. Cobaea pringlei is slightly hardier than C. scandens, regrowing from its roots in all but the most hateful winters. So if you fancy a bit of Christmas Club Tropicana then Cobaea scandens is the climber for you. Seeds are available from most good seed merchants and can be sown from January but, watch out, you won’t be able to contain your seedlings inside for long! Your photos excel by a long throw, in subject, composition, execution, and not unimportantly, generous dimensions. And your writing adds life. Photos without words are excessively dumb. Enjoy a peaceful, recollected Christmas. ishes for 2016. Thanks for the great blog. I grew that vine once and now you inspired me to try again. Planting the seeds in January is a good idea. ‘Can be grown sown from January but..’ I agree with your warning. They are rampant seedlings and I would suggest not sowing until a month before you expect the last frost. I have cuttings of pringlei indoors and they are a struggle to contain! In Cornwall scandens is reliably perennial as well. C.campanulata is an annual ‘by design’ and doesn’t make a fleshy root stock. They are all late to start into flower and here are shredded by gales just as they get going! C.pringlei is usually available from Charlie Pridham at Roseland House Nursery in Chasewater; just over the hill from your friends in Cornwall. I would offer you one of mine, but I’m not at all sure I will get any except the one in the garden through the winter. Gorgeous. I started a cobaea last spring, but it succumbed to inattention (December to February is a sprint to get tomatoes started and out; everything else suffers in the wake). I will try again in April. They are a fantastic color, and such a big, beefy, tropical vine. Great description of cobaea Tina. Him Indoors also suffers from inattention during the same period, which might account for his stunted growth 😉 Happy Christmas! Many thanks, Dan ,another plant for my Welsh seaside garden! I’m a mile from the coast – and sorting out more windbreaks. How we need those shelter belts Ann! I wish you luck getting those established. It’s worth the effort. We have more ‘Dartmoor’ weather here than mild but it is so beautiful I will give it a try as we should be getting some trellis up next year. On another note, did you have a hand in the Oxford Street store Christmas window display? My elderly parents went up on a trip and thought it very colourful. Happy Christmas! Wonderful plant, good Christmas choice!